One of my favorite places to shop for food is Trader Joe’s. 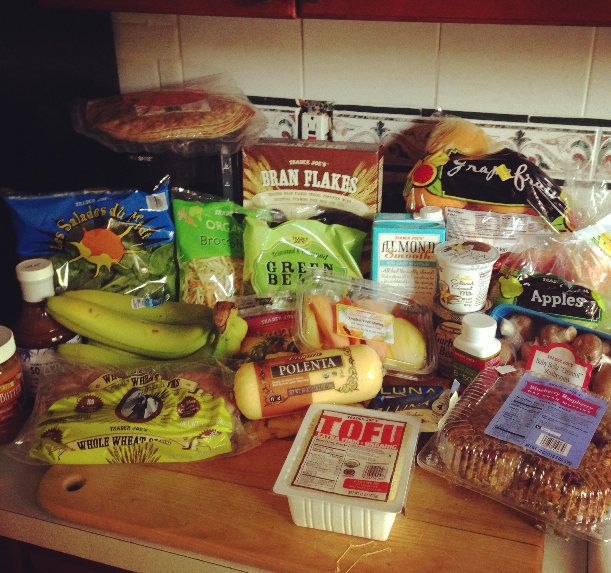 Unlike other health food/specialty stores, Trader Joe’s is affordable and not overwhelming. The limited size of all Trader Joe’s stores makes it easy to navigate and find what you’re looking for. Often, I’ll go food shopping without a list (I like to live dangerously like that) and as soon as I enter a TJ’s I know I can find things I need…and many things I don’t necessary need (ahem, imposter nutella spread). Those muffins (see bottom right corner) are divine and are probably the healthiest store-made muffins I’ve ever come across. 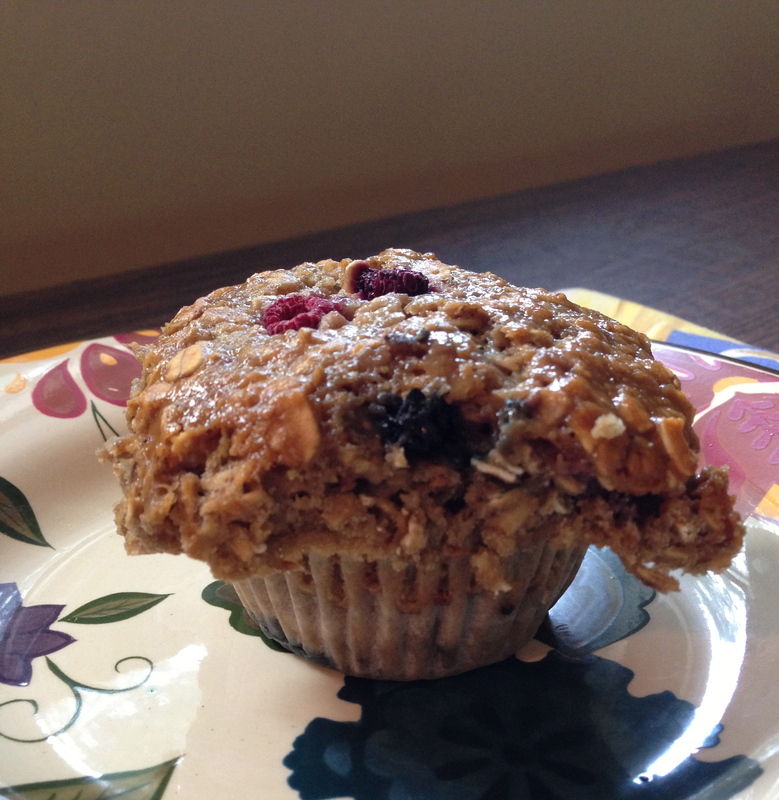 Each packs a good helping of berries (which make them easily perishable so store these in the fridge) and an ample serving of oats & other whole grains. I nibbled away on one after unpacking. I had so much to work with when considering what I should make for dinner, I opted to get creative and improvise a new recipe. Like most of the recipes I’ll be posting, it’s simple, doesn’t take a long time to prepare, and is satisfying and nutritious. sauce of your liking. I used Classico tomato sauce, because I will put tomato sauce on basically anything (yes, I am Italian). Chop onions into a size that you find suitable. I like my onions sliced somewhat fine. The smaller the slices the more the flavor will disperse and pick up notes of the other ingredients. Chop the mushrooms into small slices as well. If you’re using refrigerated/pre-made polenta, slice a 2 oz. portion into cubes. If you’re using a dry form, follow the steps directed on the package or recipe. If you’re using a mix, the consistency (firm, like a pudding, or something in between) is up to you, but stick with a 2 oz. serving. Measure a 1/2 cup dry portion of quinoa (NOTE: If you’re using brown rice, prepare ahead of time, as it can take an hour for brown rice to thoroughly cook). Spray a pan with cooking spray and allow the quinoa to get warmed up for just a minute or two. Then add 1 cup of water (quinoa requires 1 cup of water to every 1/2 cup of grain used). Stir the quinoa around for a minute. As the quinoa cooks, coat another pan with cooking spray and allow the mushrooms and onions to lightly brown. Add in the polenta cubes and baby spinach for the final 2 minutes of cooking. Try to also keep an eye on the quinoa. If the quinoa appears to have absorbed all the water and is sticking to the pan, add more water by the tablespoon. After 10 minutes, the quinoa should be done. The outer layer of quinoa can be described as O-shaped and sometimes separates from the rest of the grain. This is fine, both parts are edible and equally enjoyable. If excess water remains, you can drain it using a colander. Determine what sauce/seasonings you want to accent your dish. I went with tomato sauce, but since this dish is so simple, any sauce/dressing would be appropriate. 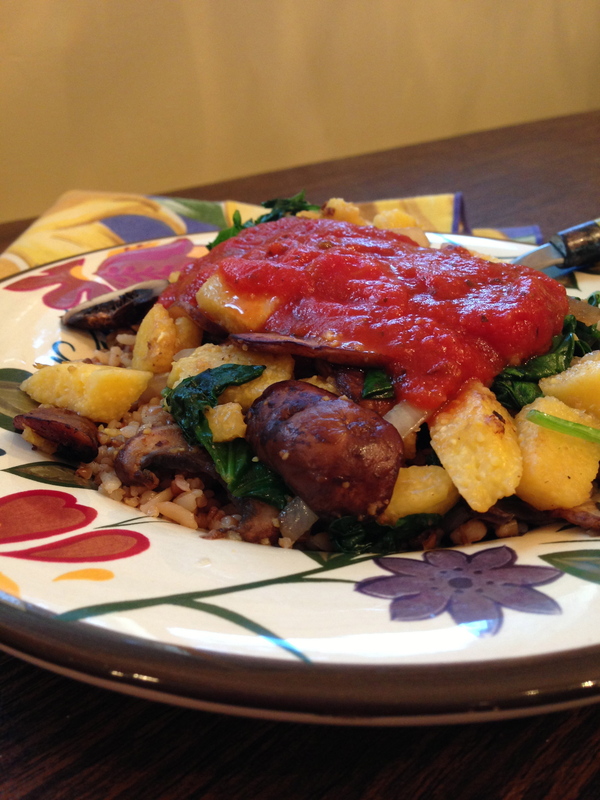 Make quinoa the base of your plate, add veggie/polenta mix, and top with sauce, cheese, etc. and ENJOY!